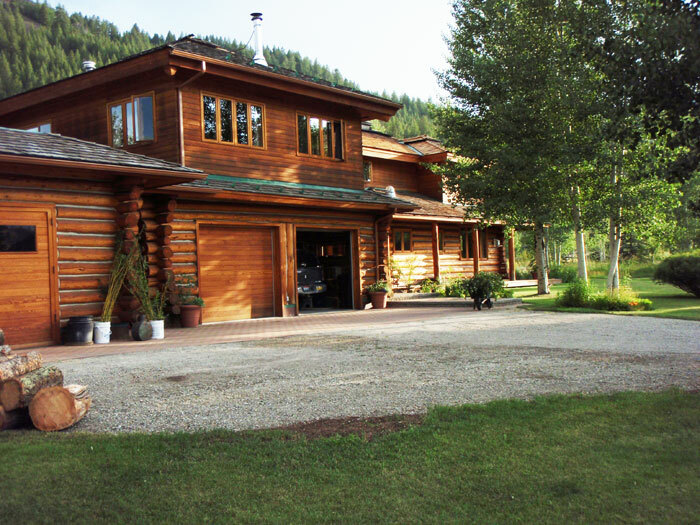 For your next vacation in the Ketchum and Sun Valley area of Idaho, consider renting this beautifully crafted, spacious luxury log cabin home. My home is located in Chocolate Gulch, just six miles north of town. Staying north of Ketchum/Sun Valley and out of the hustle of the tourist areas makes your holiday special. Feel like a local and enjoy Idaho and the wonderful recreational opportunities that are literally out the back door. Come see for yourself! This getaway offers hiking, mountain biking, skiing, running, fishing or simple relaxation just out your back door on the trails of the Sawtooth National Forest. You’ll also enjoy the small, easy-going neighborhood of gracious homes and the wonderful views in all directions. After entering through the spacious foyer of this dramatic two-story home, you’ll walk into the sunny living and dining areas centered by a beautiful Finnish Tulikivi fireplace. Click here for pictures of the bedrooms, bathrooms, kitchen, living room and dining room. The large open kitchen is modern and well equipped, including an espresso maker. Included downstairs is a guest 1/2 bath and laundry room. Upstairs in the main house are two large bedrooms each with their own tile bathroom. The upstairs bedrooms have handmade queen log beds and covered porches for reading and viewing the yard and mountains, making these rooms very comfortable. There is also an attached but completely private apartment off of the main house. The apartment offers a kitchen and living area with Italian wood stove, south-facing deck and one bedroom and one bath. Windows surround you with views of the mountains in all directions. A fourth bedroom suite is on the east end of the home. It has it’s own separate double entry or you can access the zimmer through the large garage. The east zimmer is sunny and well lit especially in Idaho’s winter. It’s glass, marble and stove bath are very comfortable. You have plenty of room to spread out or step outside from this great addition. Email and high speed wireless internet access is available throughout the house. The home comes complete with quality furnishings, including digital cable TVs, DVD player, stereo center, copy and fax machine. Enjoy the BBQ on wrap-around covered decks overlooking the spacious yard with aspens, spruce and occasional wildlife. In the summer enjoy my vegetable garden. Looking for a ski rental in Ketchum? This is it! A ski tuning bench is provided for the serious xc skier. This is an environmentally conscious vacation rental with recycling, composting, and organic products to complement the wonderful Idaho well water. Other luxuries include radiant heat throughout (including large 2-car heated garage) and an outdoor wood fired hot tub. Let my years of Idaho experience help you with any special plans.